What can I do if the CeraStar ceramic blades become blunt over time? Our CeraStar ceramic blades are produced for long-term sharpness and durability. In the event of the knife losing its sharpness e.g. frequent use in the catering business, our customer service offers you a free cleaning and regrind service in the first year of purchase. However this service is still available to you after the initial first year at a charge of 6 Euro + shipping. Unfortunately this procedure is not possible using standard grinding machines and needs to be performed using special diamond grinding media. How about the fracture strength of the CeraStar products? Will the blade break should I drop the knife. 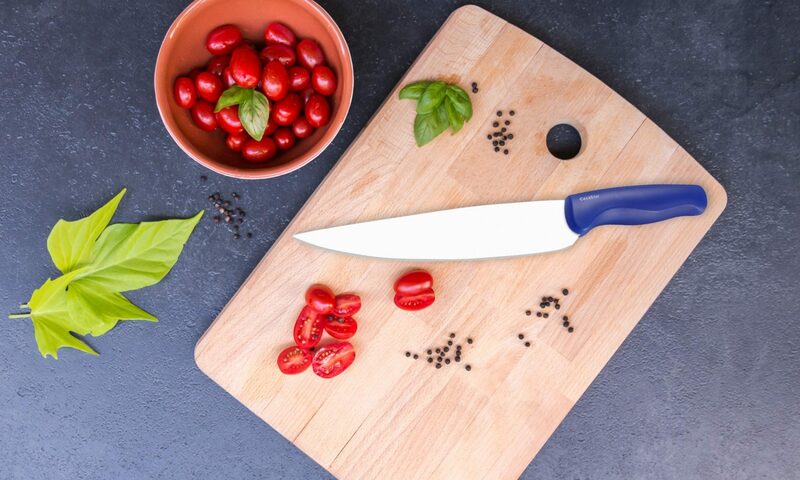 Our knives are made of a technical ceramic material and are therefore not comparable to porcelain or similar commodities. The knives themselves were designed with fracture strength in mind and are manufactured under patent laws governing the back radius of the knife. This provides the knife with similar strength compared to conventional knives. In the event of the knife dropping the chances of the blade withstanding the fall are extremely high. Under normal usage no problems should occur with your knife and the probability of the blade breaking is less than one percent. Is the Ceramic Knife dishwasher safe? All CeraStar products can be cleaned safely within a dishwasher. However it is advised to separate the ceramic knife from steel cutlery, as during the washing cycle the surfaces may come into contact with each other. This can therefore cause the white blade to tarnish slightly. This is due to the ceramic material being harder than steel. In the event of this occurring, the white blade can be fully restored using our CeraClean cleaning product. As a general guide it is sufficient to clean the knife under running water and drying it with a soft cloth. How do I treat possible discoloration on the surface of my CeraStar product? Should it ever occur that discoloration emerges on the surface of your CeraStar product, it can be cleaned with our CeraClean ceramic cleaner that we have developed for you. Simply apply a small amount of the detergent onto your knife and the discoloration’s are easily removed giving back the knife’s white shine. Do I have a choice in the handle colour of my CeraStar product? We offer the knife handle colours in white, blue, red, black and green. The handles of the CeraStar potato peelers come in the colours of black, blue, white and green. Of course it is possible for you to choose the CeraStar product in the colour of your choice.